I didn't see a Trading logs section so I hope it's ok to keep one here. Maybe you could get Michal to set up a "Trading Logs" section. It would be kinda like the workout boards that have "training logs". I started trading at the end of Dec. 08 right after X-mas. Started Live with an FXDD mini at $1 a pip. Made 93 pips first full day. Switched to $2 a pip and drained the account from a high of $1043 to It's present $331. Opened an FXCM micro to stop the bleeding and a Demo account also. I have been switching between the two over the past month or so. Actually had the mico above it's opening balance of $550 for 2 days after being down $20. It now sits at what you see here. As anyone who knows from being in the two percent club, I've been all over the map and it's time to settle down and become profitable. This will assure accountability for my actions. Tips and pointers would be great! I'll be using Dynamic BuyZone, #3 Breakouts, , and Z-lines according to TRO's rules. 16 pips at .20 per pip. Last edited by prochargedmopar on Wed Sep 14, 2016 6:08 am, edited 10 times in total. Not much to say, -95ish pips today. Disgusted with my self? Rules, what rules. pathetic. Sample of 20 trades today, My worst percentage W/L ever by far. Last edited by prochargedmopar on Tue Mar 24, 2009 3:28 pm, edited 1 time in total. Sorry for the dumb question. Where are the "TRO's rules"?? Did a little demo work tonight. 30 trades. first was with 10 cent pips or the account would have been up $70. Search for the BuyZone pdf books. Free on kreslik. May have to google them. Here is a link to one of TRO's old posts. It's short and sweet. My BuyZone chart with indicators added. 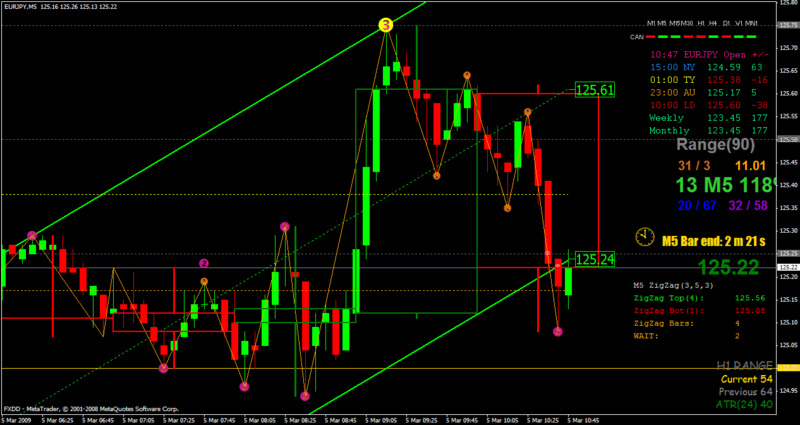 2nd is my current trading chart for ?? The dots and channel tonight is making it easier. Just got 1.7,2.2,3.1,3.2,and 3 pips using dot to dots. Many more to be had. Not even sure how the zig/zag works but it looks cool. Wow, 14 out of the last 15 in profit on demo tonight. up 27.4 pips and things are starting to click. Fighting the "live" broker added a little interest. Another was showing a pip profit and I was about to close because it stalled. FXCM froze up and I heard it stop out at -5.5 while I was showing profit. 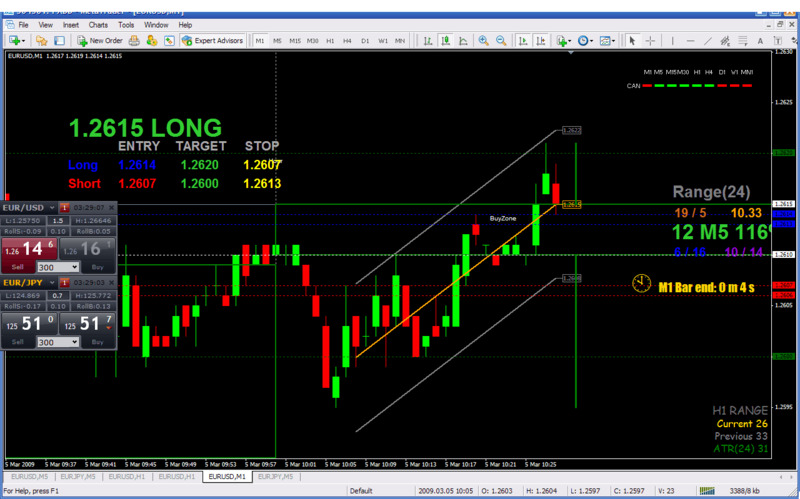 +7.4 pips total. All trades but one were "picked" correctly. closed it an -1ish. Last edited by prochargedmopar on Mon Mar 23, 2009 3:09 pm, edited 2 times in total. FXCM works good when things are smooth but has been freezing up on me lately and not changing prices while I end up getting stopped out and can't react. I may use fxdd's mt4 for a while but it's a mini so I'm limited to $1 pips. Time to step it back up!!!!!!! Switched to fxdd and took 3 trades for a total of 67 pips. Last edited by prochargedmopar on Mon Mar 23, 2009 3:10 pm, edited 1 time in total. I was wondering what Indicators you had used on the charts. Definitely its more than BZ. Appreciatete if you can name the indicators as it appears on the Navigator panel.